Official Jewish law requires 10 to be in attendance for communal prayer. Unofficial Jewish law requires that if 10 people are in a room, there must be food. Every Jewish gathering, celebration or holiday revolves around food. You may ask: What about fast days? Well, they’re about food as well. Fact: Not eating food is just as much about food as eating it. Americans like to eat too… I’m not talking about our bad reputations for unhealthy excess and obesity. Americans use food to celebrate. Though most of our holidays revolve around a grill (Memorial Day, Labor Day, Independence Day), one holiday really does come close to a Jewish celebration: Thanksgiving. But this isn’t such a surprise. Some believe that the Pilgrims based the holiday on Sukkot. Known as the Feast of Tabernacles, this holiday predominantly occurs in the fall, for the Jews of the Northern Hemisphere. Like Thanksgiving, Sukkot is a time for giving thanks for a bountiful harvest. The holiday commemorates the 40 years the Israelites spent wandering the dessert and the fall harvest. It heavily revolves around meals, which are eaten in sukkot (temporary structures) to commemorate the structures used for shelter in the desert. These meals traditionally incorporate fall harvest vegetables, creating dishes appropriate for a Thanksgiving feast. It would be convenient for these holidays to fall together. Instead, this year America’s signature Jewish holiday, Hanukkah, falls upon the most epic of American feasts, Thanksgiving. Hanukkah’s historic connection to Sukkot makes the holiday compatible with Thanksgiving. It commemorates the rededication of the Second Temple as a result of the Maccabean revolt. It is observed for eight days to celebrate the miracle of the oil lasting in the temple. The first celebration of this miracle, found in the Second Book of the Maccabees, describes this festivity coinciding with the observance of Sukkot. In essence, then, it is fitting for Hanukkah to fall on Thanksgiving, a holiday that resembles Sukkot. Thanksgivukkah, as it is has become known, is a once-in-a-lifetime occasion. And what better way to celebrate “the American Feast” with Hanukkah than with food! As stated earlier, many dishes served on Sukkot resemble those of Thanksgiving, so they will fit quite well on the Thanksgiving table—including “Moroccan Pumpkin Soup with Chick-Peas” from Joan Nathan’s book Jewish Cooking in America (Nathan 128-129). Unlike Sukkot foods, Hanukkah treats place emphasis on oil. Fried delicacies such as potato latkes and jelly doughnuts are staples on this holiday. I decided to take on the challenge myself. I went through numerous resources in the Lillian Goldman Reading Room here at the Center for Jewish History to gain inspiration. 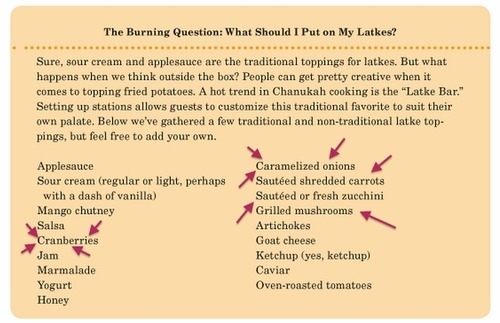 Page 86 of Jewish Cooking Boot Camp is dedicated to suggestions of toppings that could be put on potato latkes. Many of these toppings would be fitting for the Thanksgiving feast. In the picture below I have pointed out some of the suggestions that can be used to make your latkes more “harvesty.” Additionally, page 85 of the cookbook offered some quirky tips on latke making; they are also included below. 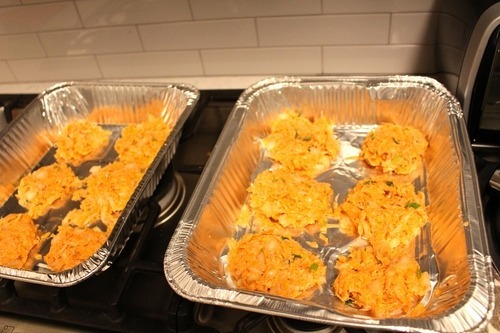 In Jewish Cooking In America, I discovered a recipe for “Curried Sweet Potato Latkes” on page 261. The recipe is a perfect use of traditional harvest vegetables eaten on Thanksgiving and fused with a Hanukkah favorite. These can be baked or fried. If baking grease the baking sheet with butter or parve substitute to make them extra crispy. If frying use peanut or vegetable oil. Grate onions and potatoes; drain and place into a large mixing bowl. 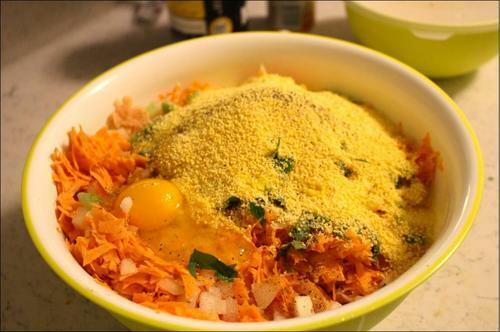 Add green onions, panko, eggs, salt and pepper into the mix. Mix well and form into palm-sized round balls. Place on baking sheet and flatten. Place in oven on 425 for 20 minutes each side. 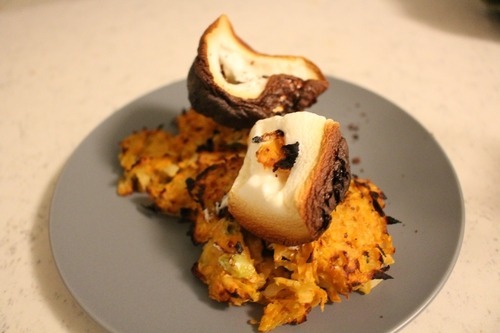 During the last 5 minutes of baking – turn to broil and place marshmallows on top of the latkes. Heat a large pan and add 4 tablespoons of oil. Carefully drop sweet latkes into the pan to fry, turning when crisp. Put on paper towels to absorb excess oil. Place onto cookie sheet and add marshmallow on top. Broil for 5 minutes or until marshmallows have melted. Enjoy hot, with cranberry sauce, apple sauce, or maple syrup. Deep fried Turkey stuffed with cranberry jelly filling. Make sure to use enough oil to last 8 days. Pumpkin flavored doughnuts stuffed with jelly filling. What better way to top your latkes on Thanksgiving Day? Pumpkin cookies can be made into Hanukkah cookies by using Hanukkah cookie cutters. 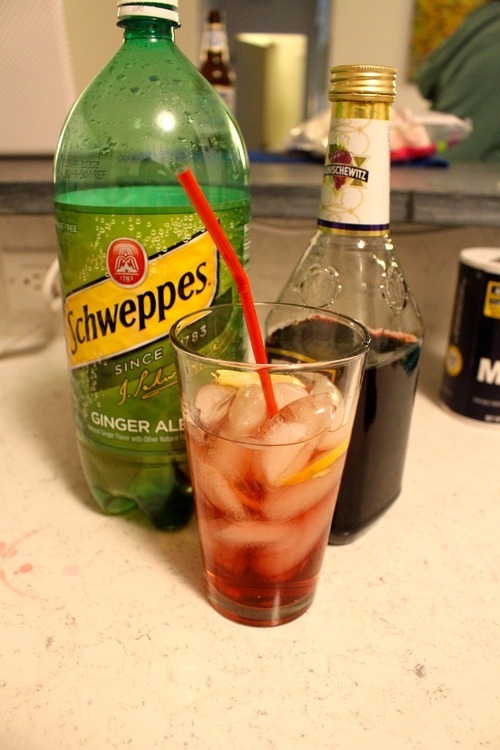 Try the Manischewitz Hi-Boy: Two to three jiggers of Manischewitz Concord Grape in a tall cup of ice with ginger ale and a slice of lemon. Three parts Manischewitz Blackberry one part brandy. Just How Special Is Thanksgivukkah? In NYC? Want StoryCorps to Record Your Family History on June 11th/12th?